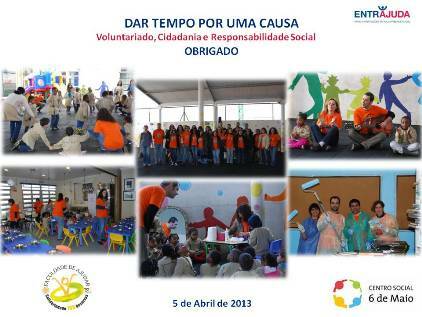 This year the charity event called “Solidarity Day” took place on 5 April 2013. Like in previous years, this event brought together non-teaching employees of FMUL – Faculty of Medicine of the University of Lisbon, of AIDFM – Associação para a Investigação e Desenvolvimento da Faculdade de Medicina (Association for Research and Development of the Faculty of Medicine) and of SPUL – Serviços Partilhados da Universidade de Lisboa (Shared Services of the University of Lisbon). With the participation of 27 extremely motivated volunteers, the event was held at the Six of May Social Centre (Centro Social 6 de Maio) in Amadora. The activity was carried out with the assistance of the “EntreAjuda” Association, which collaborated with the organizing team in its preparation and implementation. As one reads on the website of the institution, the Centro Social 06 de Maio is “a Private Institution of Social Solidarity set up in 1983 on the initiative of the Community of the Dominican Missionary Sisters of the Rosary”. It operates, preferably, in the 6 de Maio and Estrela de África Neighbourhoods, located in the peripheral area of Venda Nova bordering the Damaia de Baixo, municipality of Amadora, whose population is predominately formed by immigrants from Africa (PALOP – Portuguese Speaking African Countries) and their descendants. Its action also covers the population from other geographical areas and origins. These neighbourhoods are clandestine and face several difficulties, such as basic sanitation and health, and the lack of infrastructure has led to their degradation. Although there is no official data, and given the population’s fluctuation, 900 families are estimated to be living in the area. The team of volunteers was divided according to different activities: painting and repair jobs (in two classrooms and in the library/multimedia room) and socializing with nursery and pre-school children. After lunch, which was kindly offered by the institution and acted as an opportunity for socializing and relaxing, the works were finished up and were followed by further activities with the children. This was followed by a nourishing snack consisting of cakes and refreshments brought by the volunteers and which enabled the socialization of staff and users of the institution and FMUL’s volunteers. The goods collected in the previous week as part of the Goods Collection Campaign carried out at FMUL were also offered. At the end of the day, all those involved in this initiative were extremely satisfied about its success. The children thanked the presence of all and dedicated them some songs and drawings, which they individually delivered in a cheerful and striking final farewell ceremony. It is our intention to repeat this activity, either at this institution or at any other in need. Solidarity Day is already well established at FMUL. According to the comments posted, the people who participated found it extremely rewarding not only due to the exposure to a different reality in an institution whose mission is to “promote a better educational and family social integration for all individuals in a situation of social exclusion and help them acquire personal and social skills in order to exercise full citizenship in a spirit of human and Christian solidarity” but also due to the rewarding feeling one experiences when carrying out a good deed. This type of action helps foster relationships between colleagues, often working physically apart in independent buildings on the remaining 364 days of the year. These are occasions that stimulate a healthy camaraderie spirit that overcomes some hierarchical barriers and allows exploring new ways of collaborating outside a professional context. The day was undoubtedly a lesson in volunteerism and citizenship which instilled some nostalgia in all participants, combined with the great pleasure to help.